SINGAPORE (June 20): ST Engineering says subsidiary Elbe Flugzeugwerke GmbH (EFW) of ST Aerospace is setting up a new subsidiary in Kodersdorf, Germany, with a planned equity of €5.5 million (S$8.5 million). The new company will be responsible for the production of lightweight components, mainly comprising floor panels and cargo linings, for single-aisle Airbus aircraft. The facility will supplement EFW’s existing production line in Dresden as EFW expands its component production business. Occupying a land area of 30,000sqm, with planned investment of about €40 million, the new facility will house a component manufacturing factory, furnished with new equipment and toolings. Component production at the new facility is scheduled to start by first half of 2018. The new subsidiary is expected to create about 100 new jobs by end 2018. EFW is a 55:45 joint venture of ST Aerospace and Airbus Group. 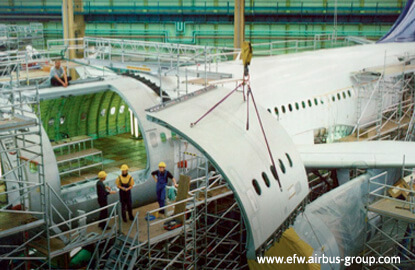 EFW combines various aviation and technology activities under one roof, including passenger-to-freighter aircraft conversions, maintenance and repair of Airbus aircraft, and the development and manufacturing of flat fibre-reinforced composite components for structures and interiors of the entire Airbus family of aircraft. It is the exclusive supplier of composite flat sandwich panels to Airbus. ST Engineering says the setting up of the new company is not expected to have any material impact on the consolidated net tangible assets per share and earnings per share of the group for the current financial year. Shares of ST Engineering closed flat at S$3.15 on Monday.